Here are some suggestions for things to do Las Vegas once you venture beyond the glitter of the Strip. Most casinos are smaller and the gambling odds are generally better. That’s because outlying casinos cater primarily to locals who demand a better chance at winning, especially on slots and video poker machines. If you don’t have a car and don’t want to pay taxi fares, you can get to most places by public transit. Some of the away-from-the-center casino hotels provide free shuttle service from and back to the Strip. 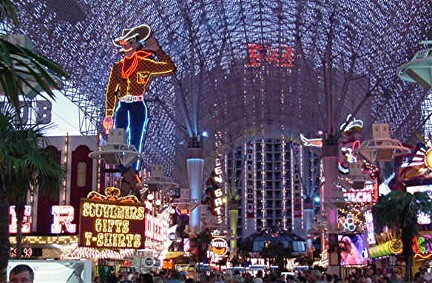 You won’t want to miss an evening trip to downtown Vegas to take in the Fremont Street Experience light and sound show. Using two million individual bulbs and a 550,000-watt sound system, the spectacle is projected on a giant screen over the Fremont Street pedestrian mall which stretches for several blocks. This is without question one of the most energizing and upbeat things to do Las Vegas. Beginning at dusk, the show plays every hour on the hour until 11 p.m. The Sports Hall of Fame at Las Vegas Club features the most complete collection of baseball memorabilia outside of Cooperstown. You can view the World Series bat collection (1946-1958), along with autographed baseballs, photos, and other sports mementos. At the Golden Nugget Hotel and Casino, next to the gift shop, guarded in a secure display case, is the largest golden nugget ever discovered. The rock weighs a massive 61 pounds, 11 ounces. This is not only one of the things to do Las Vegas; it also provides a great photo opportunity. This casino is full of antiques, collectibles, and memorabilia as diverse as 18th century street lamps from Brussels, Buffalo Bill’s private rail car, a fireplace from a castle in Scotland and woodwork from benefit historic American mansions. There’s even a piece of the Berlin Wall, but ladies, for this free thing to do in Las Vegas, you’ll have to venture into the men’s bathroom! The open-air Neon Museum’s mission is to collect and preserve neon signs associated with Las Vegas. The collection ranges from the 1940s to the present. If you’re interested in aviation history don’t miss this free exhibit, located above baggage claim on level two. The displays focus on commercial and general aviation, ranging from the 1920s to the arrival of modern jets. There is free shuttle service from Harrah’s on the Strip to the Rio. One of the best free things to do in Las Vegas is to take in this half hour show performed above the casino floor. This multi-million dollar extravaganza features dozens of exotically costumed performers in a masquerade party that is fun, fun,fun. Shows run several times a day, usually between 3pm and 10pm. A free shuttle bus runs hourly 10 a.m. to 7 p.m, with stops at the Forum Shops, the Fashion Show Mall, the Stardust and the Hard Rock Casino Hotel. Here you can view one of the largest collections of rock memorabilia anywhere. The range of exhibits is vast, showcasing the sublime to the ridiculous. On one hand are museum quality displays including vintage Beatles records. On the other, if you ever wanted a peek at Madonna’s outrageous underwear, you can see it here–another of the things to do Las Vegas. Located across from the Hard Rock Casino Hotel is something completely different: the first authentic German-Bavarian Beer Garden in Sin City. This is one of the things to do Las Vegas you can get for the price of a mug of beer. The brew is shipped to the Hofbrauhaus directly from Munich; you can enjoy genuine German ”Gemütlichkeit”. Live music abounds, it’s Oktoberfest every day of the year. 15 minutes from the Strip you can take a tour of the Ethel MChocolate Factory, where you’ll see how candies are made and get a free sample. Then you can walk through the adjoining 2 1/2 acre Botanical Cactus Garden featuring over 350species of cactus, succulents and desert plants. One more of those free things to do Las Vegas that is educational as well as yummy. Daily 8:30amto 7pm. The octagonal 117,000-gallon saltwater aquarium, located in the Mermaid Lounge and Restaurant, features thousands of colorful and unique species of fish, including sharks and stingrays. If you’re there at feeding time, marine biologists will be happy to talk to you. Free shuttle to Sam’s Town from Stardust, Bourbon Street Hotel and Harrah’s on the Strip and from Main Street Station, Downtown. Take a leisurely stroll in Mystic Falls Park, day or night at Sam’s Town. The sounds of a rolling waterfall compliments the soft chirping of birds in live trees reaching up toward the skylight ten stories above. Suddenly, the serenity is interrupted with the urgency of a wolf’s call,howling from atop the waterfall. It’s the beginning of Sunset Stampede, a free laser light and water show, daily at 2:00 p.m., 6:00 p.m., 8:00 p.m. and 10:00 p.m. The mountain in the Mystic Falls Park comes alive as the Sunset Stampede chronicles the Western pioneer experience with music, lights and animation. 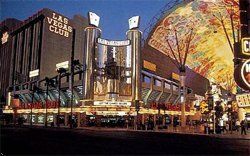 Entertainment that costs nada – another one of those free things to do Las Vegas. Visiting M&M’s World is probably the sweetest of all the things to do Las Vegas. Located in the Showcase Mall, this 26,000-square-footestablishment is not your ordinary outlet mall store. Let the escalator transport you to multiple levels where you’ll learn more than you ever wanted to know about the candies that “melt in your mouth not in your hand”. Open daily 9am to 11pm. The Red Rock Visitors Center contains a unique exhibit of area artifacts, photographs, depictions of early inhabitants, and a desert tortoise habitat.And it serves as your introduction to Red Rock Canyon National Conservation Area. In stark contrast to a city geared to entertainment and gambling, Red Rock Canyon offers peace,serenity and nature’s beauty.